» Blog Archive » Moo… On Shelf Now! « Celebrating Hobbs 30th Birthday! 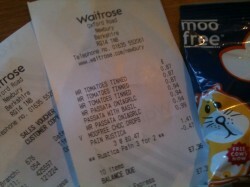 During a visit to our local Waitrose, Gecko was delighted to see that Moo Free was on the shelf! And, it was obvious that people had been buying the delicious Moo Free chocolate drops and Moo Free chocolate bars too! We couldn’t resist – so we bought some of this fabulous dairy free chocolate too as a little treat – yummy!